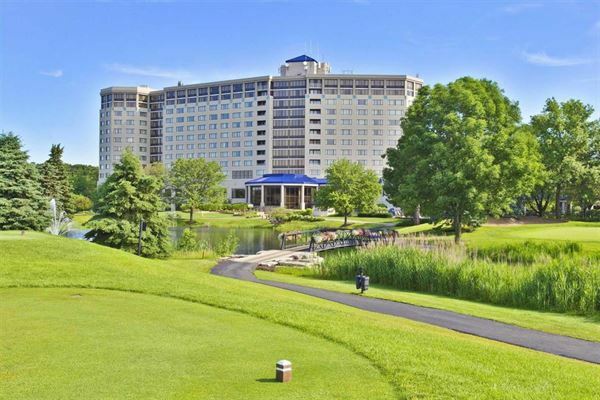 Just west of downtown Chicago, nestled in the quiet suburb of Oak Brook, Illinois, Hilton Chicago/Oak Brook Hills Resort & Conference Center offers an inspired setting for meetings, getaways, golf outings, weddings and social events. 386 rooms and suites, 42,000 sq. ft. of newly renovated meeting and event space, an 18-hole championship golf course, indoor and outdoor swimming pools and numerous dining options create the perfect destination for business and leisure travel. Our 13,000+ sq. ft. Grand Ballroom can accommodate up to 1,500 guests. The hotel also offers more than 20 breakout rooms, many overlooking the scenic golf course. Full event menus and catering services are available to handle all specific group needs. At the last minute, my organization had to schedule a very important meeting at the Oak Brook Hills Resort. We had suddenly outgrown the venue where we had initially arranged our gathering and needed a larger space. We were fortunate that this resort could accommodate us. The classroom style of the large room was perfect for the presentation. Acoustics were excellent and the sound system worked very well. The stadium seating was comfortable, with padded chairs that kept everyone in their seats with no problems or complaints. There was a screen available for our PowerPoint presentation. A big lobby area for registration made it easy to handle this process without disturbing the meeting. We had more than enough outlets for our machinery and tables were set up easily. The facilities for telephones and restrooms were convenient and well-appointed. The staff at the Oak Brook Hills Resort was professional, helpful, warm and welcoming. Our attendees easily found the meeting room, had abundant parking and enjoyed a great experience. They could not tell that the event was scheduled and organized at the eleventh hour. Everything went smoothly. There are several dining options at the resort. I was able to have a casual meeting after the presentation in their lounge. We had delicious, beautifully prepared food. I had missed dinner because of the rushed preparations beforehand. It was wonderful to have a choice of eating places in the same building. All of us ate heartily and enjoyed the appetizers. I will definitely keep this resort in mind for future business events. The hotel is set on luxurious, well-groomed grounds. It has an elegance that lent our organization an air of prosperity and professionalism that served us well.